Johann Koerbecke was a painter active in Münster, Westphalia, in the second half of the 15th century. His style reveals the influence of the great Flemish masters as well as that of the painter Konrad von Soest. When devising his compositions he emphasised both the figures and landscape, which are depicted with great realism. In addition, Koerbecke was particularly interested in the study of perspective. The Assumption of the Virgin was part of the high altarpiece of the abbey church at Marienfeld. When closed it showed eight episodes from the Passion of Christ, and when open, eight scenes from the Life of the Virgin. The paintings on these doors were detached before being auctioned in 1803 after the monastery was de-consecrated. The present panel is considered the finest in the group due to its innovative elements and the way in which Koerbecke resolved the union between the earthly and heavenly realms. The lower part depicts the twelve Apostles, clearly individualised and grouped around the Virgin’s tomb. The upper part, with a gold background that distinguishes it from the earthly zone, depicts Christ with angels receiving the Virgin. During the 15th century Johann Koerbecke was the most important artist in the Westphalian city of Munster. He trained in the workshop of his father, Hermann Koerbecke, and took over its running after Hermann’s death. Koerbecke’s work reveals a knowledge of Early Flemish painting, in particular that of Robert Campin and the Van Eyck brothers, which has led to the suggestion that he made a trip to the southern Low Countries. His work combines the innovations of contemporary Netherlandish art with the influence of the style of Konrad von Soest. Koerbeck seems to have occupied a respectable social position in Munster and was a member of the confraternity of Our Lady of Saint Egidius between 1440 and 1460. Koerbeck’s masterpiece is undoubtedly the altarpiece for the high altar of the Cistercian abbey church at Marienfeld. The present panel in the Museum’s collection originally formed part of this altarpiece. The altarpiece was commissioned by the abbot of the monastery, Arnold von Beveren, whose coat-of-arms appears on the depiction of The Annunciation (Art Institute of Chicago). The altarpiece was installed on 6 February 1457 and was consecrated on 25 June the following year. The central section consists of a sculpture of the Virgin enthroned, framed by 24 gilded busts housing relics of saints Ursula and her companions. The altar had two wings that, when closed, showed eight scenes from the Passion of Christ and when open, eight episodes from the Life of the Virgin. The Assumption, one of the most important Marian feasts in the Catholic calendar, was part of the inside right wing. From documents in the abbey’s archive we know that in 1456 the painter received a part payment for the altar. Inevitably, its style went out of fashion over the years and in the 17th century two wings were installed that covered over the 15th-century work. Following the secularisation of the monastery in 1803, Koerbeck’s paintings were detached from the doors and sent to auction. This fact is confirmed in a report by Johann Christoph Rincklake that records the 16 panels from the two doors, along with other works that had been removed from their original settings and framed individually. 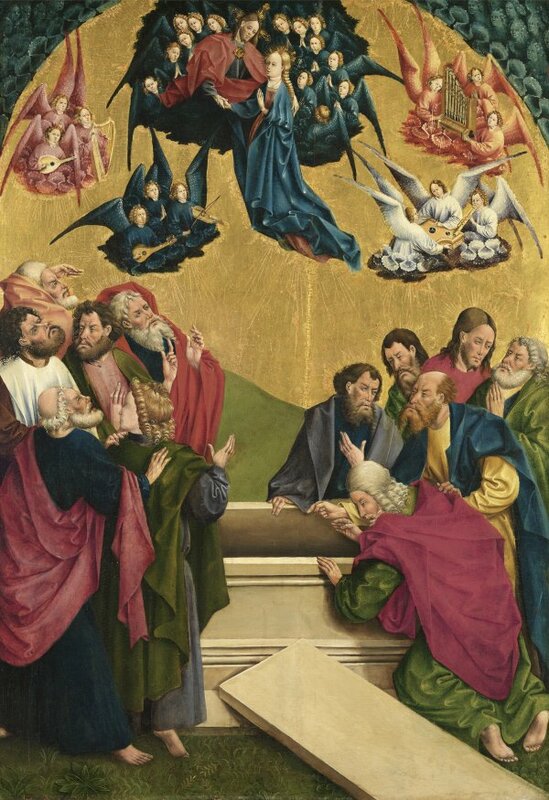 The Assumption of the Virgin is considered the finest panel of the altarpiece due to the innovations that the artist introduced and the way in which he resolved compositional problems such as the connection between the heavenly and earthly realms. In the lower half, the twelve Apostles, whose faces are fully individualised, are grouped around the Virgin’s empty tomb. The lid of the tomb, which creates a marked diagonal in the foreground, is in itself an innovation due to the position in which the artist has located it, in the immediate foreground. In addition Koerbecke paid careful attention to the poses, gestures and reactions of the Apostles before the miraculous event that they witness. These movements are used to create a link between the different members of the group arranged around the tomb. In the heavenly realm the gold background is used to emphasise the difference between the divine and the human. In addition to the realism used in the treatment of the Apostles, Koerbecke swathed them in draperies of bright colours whose intensity creates a sense of continuity with the celestial scene above. Christ, located in front of a compact group of angels, receives the Virgin, who is accompanied by four groups of musical angels that float on schematic clouds. The Assumption of the Virgin entered the Thyssen-Bornemisza collection in 1929, having been acquired from the Julius Böhler gallery in Munich. It was previously in a private collection in Westphalia.